Using iPads and eSpark, Elizabeth Forward—an innovative rural school district in Western PA—accelerated student learning, empowered teachers, and saw incredible achievement results. The Elizabeth Forward School District, located 35 miles south of Pittsburgh, was looking for new ways to help its students achieve. The rural district had already established a reputation for innovation by achieving national recognition as an Apple Distinguished School and acceptance into Digital Promise’s League of Innovative Schools. After visiting another district in the League, administrators at Elizabeth Forward were impressed by the effect iPads could have in primary grades to raise achievement and increase engagement levels. They wanted to implement personalized iPad learning in their own district to continue innovating with technology, and they were “intrigued by the apps and how pushing apps out to students can increase student achievement,” said Assistant Superintendent Dr. Todd Keruskin. The district decided to pursue a 1:1 iPad implementation in October of 2013. Without extra room in the budget to fund a personalized iPad program, leaders at Elizabeth Forward examined the effectiveness of their current programs and found that many were not having a meaningful impact on student learning. “Look at your budget and question the programs you have in place to see which are effective in improving student achievement.” Dr. Keruskin explained, “We were spending almost $400,000 on replacement iPods, laptops, and desktops. We spend less than $400,000 now on a lease program and every student has an iPad and gets to take them home.” After acquiring hardware, the district needed a way to prove that iPads would not only increase engagement, but improve academic achievement as well. Administrators decided to couple the iPad roll-out with personalized learning plans for every student provided by eSpark Learning. In December 2013, the district administered its first NWEA MAP assessment to students. In January, teachers began piloting eSpark in all kindergarten classrooms and Special Education and Response to Intervention (RtI) in first and second grade. Using a 1:1 model, students engaged in personalized learning on the iPad for an hour a day guided by eSpark through differentiated third-party apps and instructional content. Because Elizabeth Forward implemented eSpark with full fidelity, students at Elizabeth Forward completed twice the amount of content in one semester than most eSpark students complete in a full school year. Given the opportunity to rate each app, video, or instructional challenge with a positive “thumbs-up” or negative “thumbs-down,” students gave an average approval rating of 93%, indicating high levels of engagement with the curriculum. Students gave eSpark activities an average approval rating of 93%, indicating high levels of engagement with eSpark's curriculum. "I'm amazed by eSpark Learning. I know teachers don’t have enough time to find which apps are effective and aligned to each Common Core standard and grade level. eSpark does that for us." By assessing students in December and June with the NWEA MAP, this data provided visibility into the learning gains experienced in Elizabeth Forward. “We had that baseline from December without using eSpark, and then in the beginning of June we gave our final NWEA MAP assessment and we just saw incredible results. It blew us away,” said Dr. Keruskin. In December, the average of students who would not be using eSpark performed in the 63rd percentile nationally. Because of the other innovative initiatives and excellent teaching at Elizabeth Forward, non-eSpark students demonstrated impressive gains and ended the school year in the 71st national percentile.The kindergarteners and first and second grade SPED/Title I students who used eSpark started the year significantly behind their peers, averaging in the 48th percentile nationally. After just one semester of using eSpark, these students grew an average of 25 percentile points by June performing in the 73rd national percentile—closing the achievement gap and ending the year slightly ahead of their non-eSpark peers. After one semester of eSpark, eSpark students grew an average of 25 percentile points performing in the 73rd percentile on the Spring MAP. NWEA estimates that scores near the 70th percentile on the MAP correspond to a strong probability of college readiness. 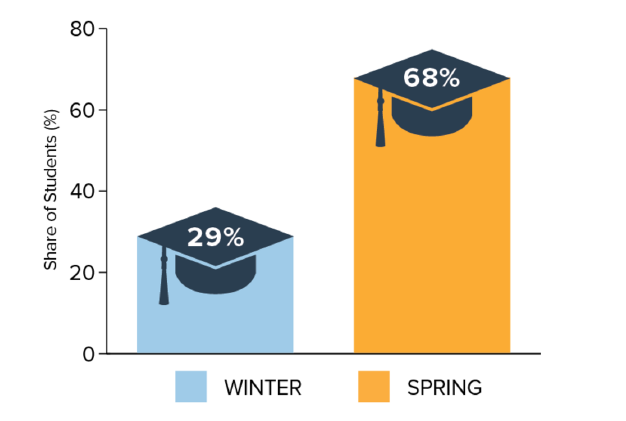 Based on this benchmark, only 29 percent of eSparking students at Elizabeth Forward were on track for college in December. After one semester of personalized learning with eSpark, Elizabeth Forward more than doubled the number of students scoring above the 70th percentile nationally with 68 percent of learners on a path toward college. After one semester of personalized learning with eSpark, more than double the number of students scored above the 70th percentile nationally with 68 percent on a path toward college. These significant academic gains are directly correlated to the daily usage of eSpark by students and teachers at Elizabeth Forward. With the success of this Pennsylvania school district, it is evident that iPads can be highly effective in raising student achievement and engagement when personalized with eSpark. With teachers empowered to integrate new technology, districts can expect high-fidelity classroom usage. Elizabeth Forward’s success shows how incredible results are possible with iPads and eSpark in a small amount of time. "We love eSpark! I have a little boy working on multiplication [as a kindergartener]. I would never be capable of differentiating to this extent by any means and the kids are amazing with it!" eSpark in Action at Beavercreek City Schools.